The 2014-2015 SRTS Annual Report for Northeast Iowa is now available. The report analyzes the spring Travel Tally results from May of 2015. As Iowa’s only rural, regional SRTS effort, Northeast Iowa’s SRTS program continues to be the forerunner in the social movement to bring SRTS education and encouragement to rural populations. To learn more about SRTS work in Northeast Iowa, contact Ashley Christensen, UERPC’s Regional SRTS Coordinator- achristensen@uerpc.org or 563-382-6171. 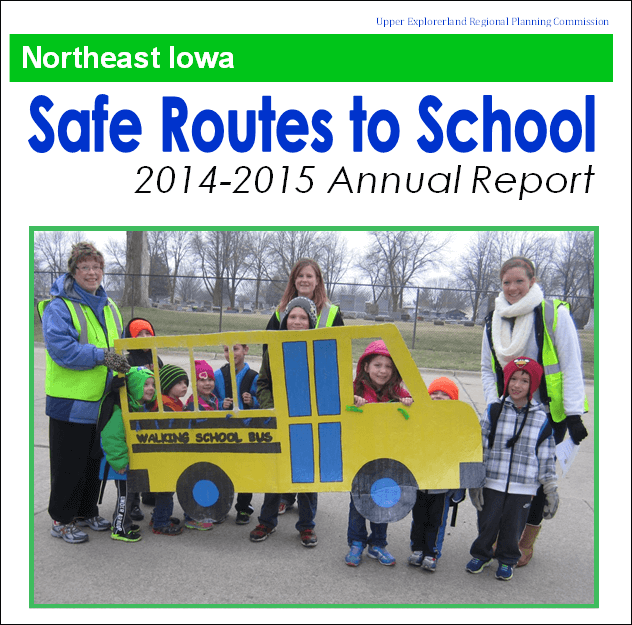 This entry was posted in Active Living, Allamakee CSD, Central CSD, Decorah CSD, New Hampton CSD, North Fayette Valley CSD, Oelwein CSD, Postville CSD, South Winneshiek CSD, St. Joseph School by Northeast Iowa Safe Routes to School. Bookmark the permalink. Outstanding work, Ashley! Kudos to you and all of the regional stakeholders and school outreach team for a terrific year! Your leadership and efforts in communities are making a very positive difference in children’s health in our region! Thank you, Ann! SRTS support is really beginning to build throughout the region. It is exciting to watch it unfold!